Today in Movie History is a mobile application that displays historical facts for any given date, covering topics from birth dates, death dates, movie release dates, anniversaries and even important dates from your favorite movies (just to name a few). The app allows you to share these facts to Twitter, FaceBook, email or Text Message (on compatible devices). So tell your friend which famous celebs share their birthday! For example, did you know on November 5, 1955 – Dr. Emmett Brown (Back To The Future) hits his head on the sink and awakens to idea for the flux capacitor (requiring 1.21 jiggawatts)? Maybe you’re more interested to know that December 5, 1901 – Producer, director, screenwriter, voice actor and animator Walter ‘Walt’ Disney was born in Chicago, Illinois. Other apps may provide facts about history, but “Today in Movie History” has just expanded their database to over 3000 facts (and growing), it allows you to share them via Facebook, Twitter, text messaging, email, and it’s available for Android, iPhone, iPad and iPod Touch! If you feel there is a fact missing that should be included, you can even submit your own from within the app! While the application was designed with movie enthusiasts in mind, it’s fun for everyone. “Great app! Stable and reliable. But most importantly, F-U-N! Don’t know what movie to pick? Open up this app and get an inspired idea. Get ideas for new movies and be reminded of favorites. Love this app!! !” said Lisa915m on the App Store. 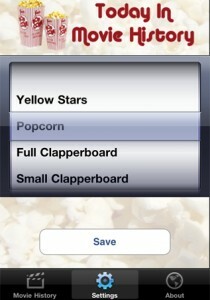 “Awesome app for movie buffs! A great way to share film facts via email, Twitter, or FaceBook.” said hydeandgeek on the Android Market. Today in Movie History comes in two flavors for Android, the Lite and Full version (Lite not yet available for iPhone). Movie History Lite is the same as Movie History, except it’s supported by advertisements, lets you only view the events for the current date and you’re unable to share the facts. For only 99 cents, it will remove the ad’s, you can search for any date and it will allow you to share these facts with your friends and family! Jebs Apps, LLC is pleased to announce the release of their newest mobile application, “Today in Movie History” for iOS platforms, iPhone, iPad and iPod Touch! Also available for Android; the app just received a major update in conjunction with this release for iPhone. The “Bone” Movie Is Finally Happening! Comments for “Today in Movie History” hits App Store are now closed.